A unique tribute to Celtic’s greatest ever player to mark the 60th anniversary of his first appearance for the club. Billy McNeill is the greatest Celt of all time. He spent his entire playing career at the Glasgow giants and made 790 appearances between 1958 and 1975, winning the European Cup, nine Scottish League Championships, seven Scottish Cups and six League Cups in a glittering career. And it all started on 23rd August 1958 when Billy McNeill made his Celtic debut. 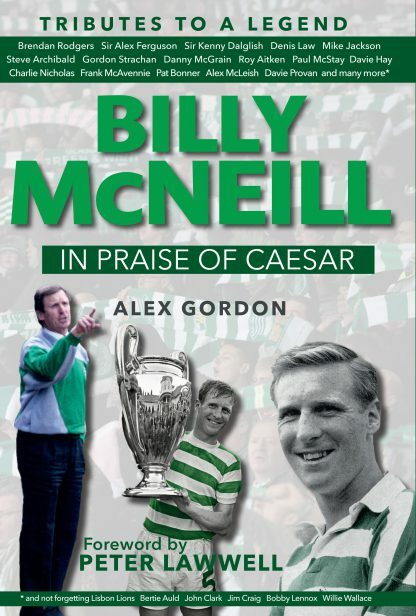 Billy McNeill’s breathtaking journey through the beautiful game is charted here from his debut against Clyde through the momentous years as player and manager, the highs, the lows, the triumphs, the tears. Sixty years on from his debut, this unique book celebrates the astonishing life and times of one of world football’s best-loved personalities with tributes from many greats of the game. Celtic chief executive Peter Lawwell pays his own special tribute to the Parkhead hero along with a Who’s Who of the game’s royalty. They share their unforgettable experiences and wonderful memories of playing with and against Billy McNeill, one of football‘s most respected and well-loved men, and talk about him both as a world-renowned footballer and as a genuinely much-admired figure. Packed full of anecdotes and tributes, In Praise of Caesar is a must-read for all Billy McNeill and Celtic fans, and football supporters everywhere. Alex Gordon is a former Sunday Mail Sports Editor and Daily Record Chief Sports Sub-Editor and has also worked as a columnist for World Soccer Monthly and as the Scottish correspondent for France Football and L'Equipe. 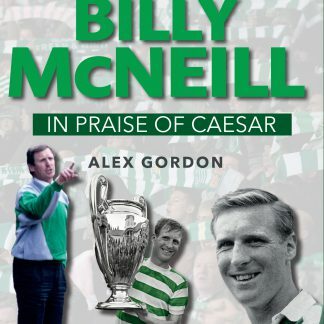 This is his fifteenth football book, a list which includes The Lisbon Lions; The 40th Anniversary and Celtic: The Awakening while co-authoring autobiographies such as A Bhoy Called Bertie with Bertie Auld, The Quiet Assassin with Davie Hay, All The Best with Tommy Gemmell and Yogi Bare with John Hughes. He is a lifelong Celtic fan.